Craftsman 42 piece 1/4 and 3/8-inch Drive Bit and Torx Bit Socket Wrench Set Just $29.39 Down From $99.99 At Sears! You are here: Home / Great Deals / Craftsman 42 piece 1/4 and 3/8-inch Drive Bit and Torx Bit Socket Wrench Set Just $29.39 Down From $99.99 At Sears! 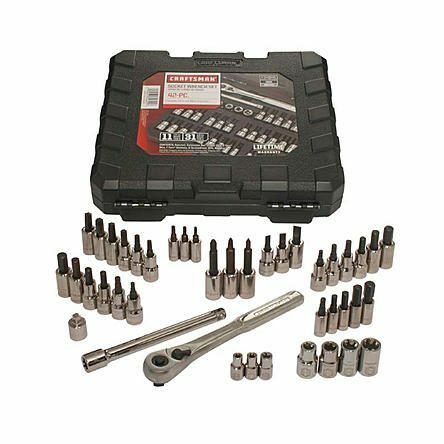 Sears has this beautiful Craftsman 42 piece 1/4 and 3/8-inch Drive Bit and Torx Bit Socket Wrench Set on sale for $29.39 (Reg. $99.99)! 42 piece drive and Torx wrench set includes: 1/4-Inch Drive: 5 Standard hex bit sockets (3/16, 7/32, 1/4, 5/16, 3/8″); 3 Torx bit sockets (T15, T20, T25); 3 External Torx sockets (E6, E7, E8); 3/8-Inch Drive: 6 Standard hex bit sockets (5/32, 3/16, 7/32, 1/4, 5/16, 3/8″); 6 Metric hex bit sockets (4, 5, 6, 7, 8, 10mm); 3 Slotted screwdriver bit sockets (7/32, 9/32, 3/8″); 3 Phillips screwdriver bit sockets (#1, #2, #3); 6 Torx bit sockets (T27, T30, T40, T45, T47, T50); 4 External torx sockets (E10, E12, E14, E16); Quick-Release Ratchet’ 6″ Extension Bar and 1/4″ Adapter.